Danielle and Phillip chose a style for their home that is the result of a monumental marital compromise. Phillip prefers 19th century antiques and Danielle loves mid-century modern. 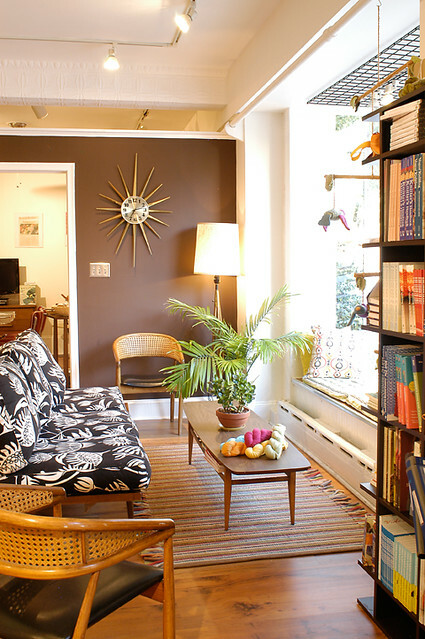 They settled for a decidedly in-between look – leaning toward a classic American and contemporary mission aesthetic, but with a funky industrial edge and details that reflect Danielle’s vocation – teaching knitting and running fibre space, her bustling knit and crochet shop in Old Town. Here’s a shot of the lounge in fibre space where Danielle fulfills her love of midcentury modern decor. 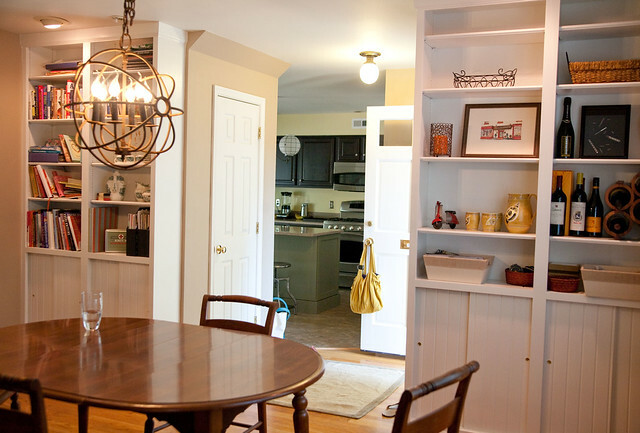 As a small business owner, it goes without saying that Danielle spends most of her days running fibre space, but she still found the time to do much of the hands-on renovation in her home over the course of a couple of weeks. 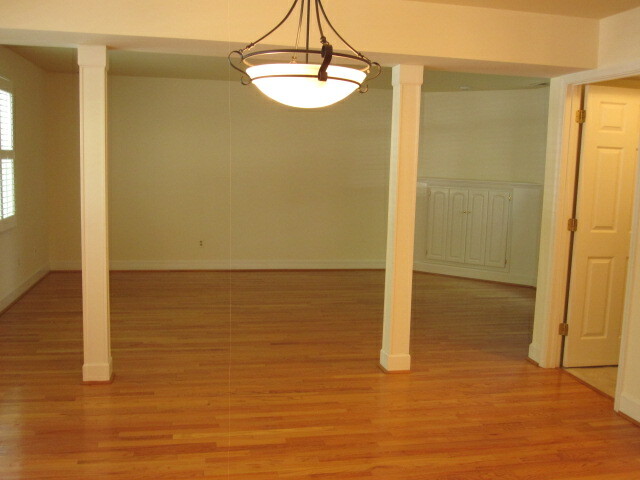 The blank slate Danielle and Phillip started with for the main floor looked like this when they moved bought their townhouse in June. They kept the columns, didn’t touch the floors, although they’d like to refinish them sometime soon, and gave the walls a fresh coat of paint. 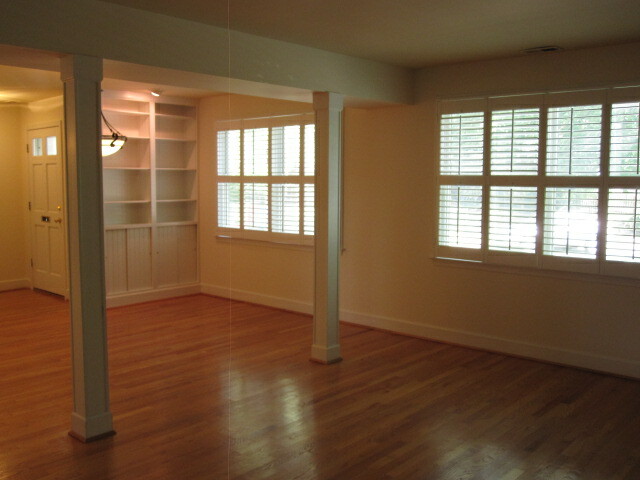 They decided to keep the plantation shutters and they dug the built-in bookshelves with the fabulous sliding doors across the bottom shelves. 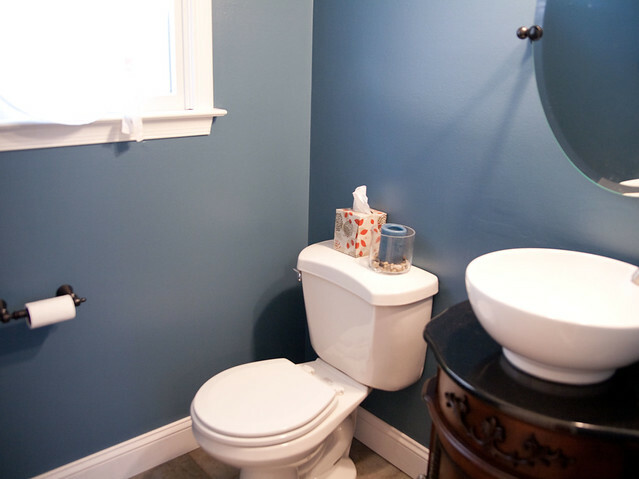 Some of their neighbors with similar layouts expanded the powder room into a larger bathroom by breaking through to the closet. Danielle and Phillip felt they needed the storage space for Danielle’s yarn and the dog supplies (they have two Italian greyhounds) and other odds and ends, so they decided on the shelf layout and got racks at Home Depot cut to size in the store. 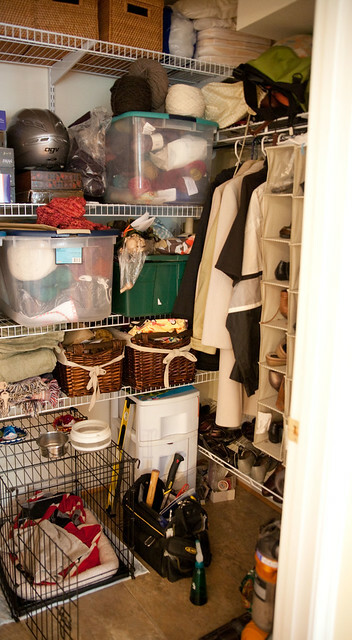 The entire closet organization cost less than $150. They drilled into studs and added rubber stoppers at the ends of the metal racks. 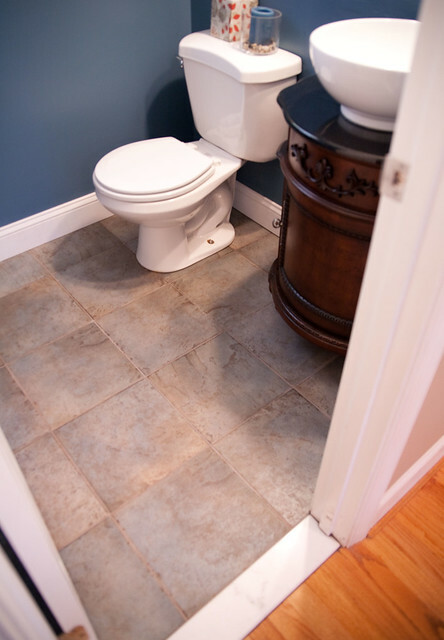 The hardwood floors in the powder room were damaged because they were unfinished under the cabinet that Danielle and Phillip removed, so they paid to have the floors retiled. Then, they painted and replaced the sink, cabinet, mirror and light fixtures from Lowe’s, squeezing all of their new purchases into their Mini Cooper. What I love about Danielle and Phillip’s house is that everything in it has a story. Every last detail in the renovation of their 1990s townhouse reflects their meticulous research into the most authentic, highest quality resources at the best prices. Their dining table and chairs hadn’t been delivered yet, but these are the models they chose and bought from European Country Living in Old Town. They found the Persian rug on Overstock for a song. 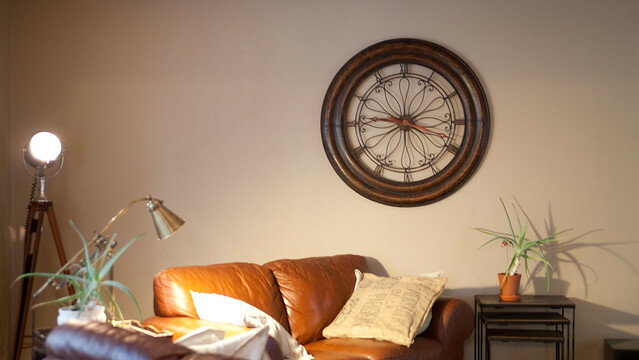 Danielle wanted a large clock, in the style of an old London rail clock. So, she typed “large clock” in Craigslist and whaddya know, someone listed this one for a fraction of the price you’d find in a retail store. What’s more, it keeps time. 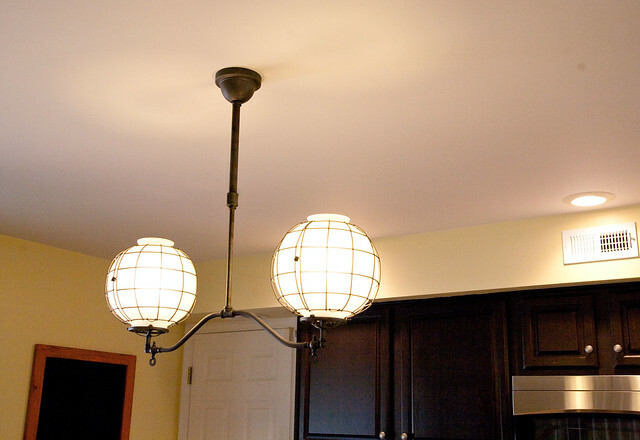 The search light is a more economical copy of the model she found in a Restoration Hardware catalog. The trunk behind the couch was a curb find. She spotted it at the end of her street and called Phillip immediately. He “rescued it,” cleared away the cobwebs and dust, and polished it to a shine to surprise her when she came home that night. 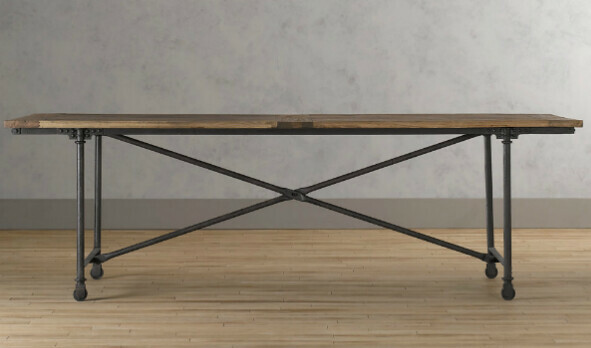 Danielle researched the original design for the factory cart turned coffee table that is prominently featured in the latest Restoration Hardware catalog. A Google search turned up the authentic Lineberry carts at a salvage shop near Lynchburg, VA. Danielle and Phillip hopped in their Mini Cooper for a 5-hour road trip down scenic country roads thinking they’d pull up to someone’s ranch house. (The Web site reveals very little.) Instead, they encountered a gold mine at Nelson Storage Architectural and Industrial Salvage. In fact, DIY Del Ray is itching to check this place out. The owner is something of an outsider artist working with the materials he collects. 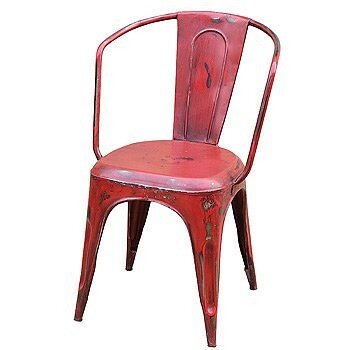 Danielle says the selection of antiques and salvage goods will blow your mind. The photos on the mantle are family heirlooms. 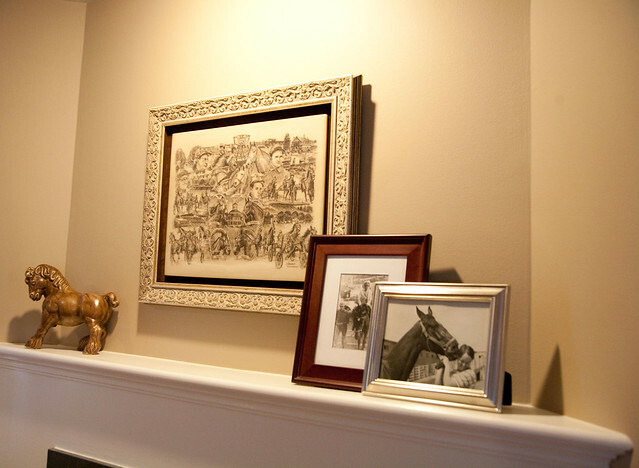 Danielle’s father won the plaque in the center at a horse race in the 1970s. The middle photo shows her grandmother visiting her family’s home in Serbia. The image on the right is a photo from the NY Post of her mother with “Moshannon Express,” an undefeated racehorse at the time. 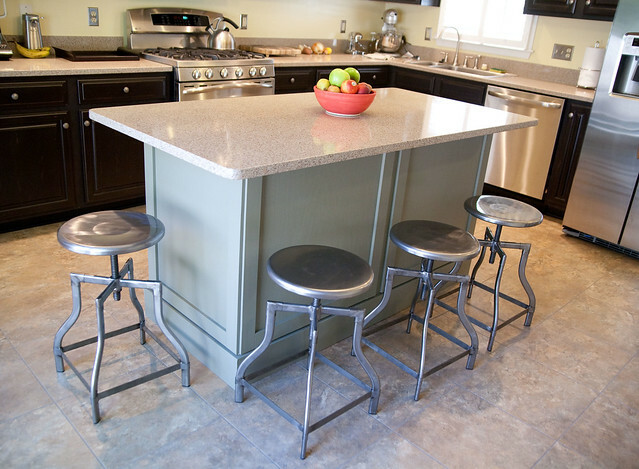 They gave them a distressed look for an amazing deal, which included new molding and construction of the center island painted in an antique green. 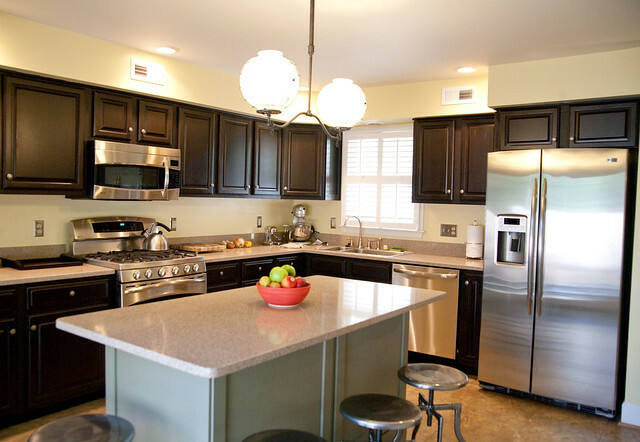 Picasso Cabinet provided the silestone countertops as well. 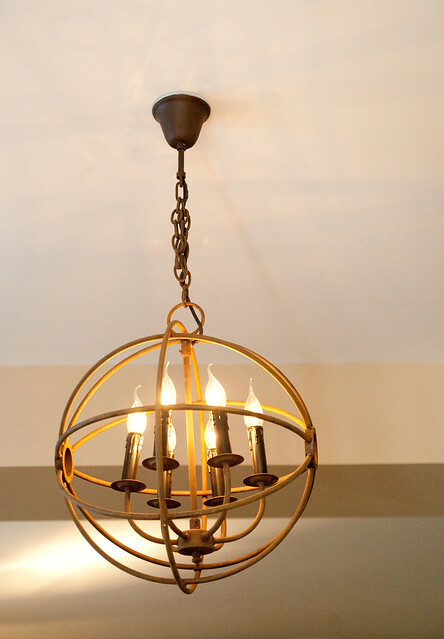 Danielle put her mark in the kitchen by choosing a light fixture from Rejuvenation, which specializes in making replicas from antique molds. She found the chairs at Industry West. Upstairs is where you’ll see evidence of Danielle’s knitting life. 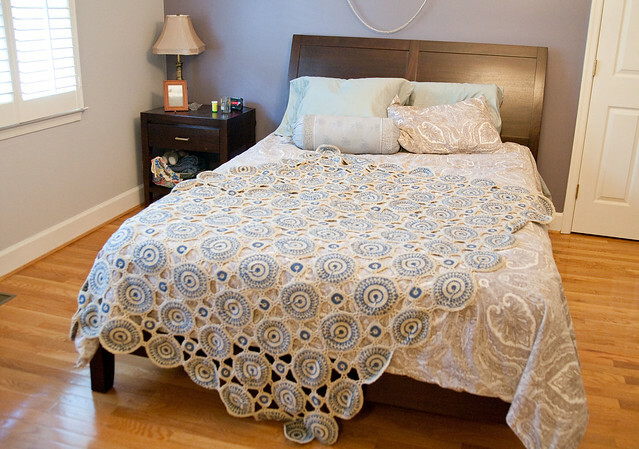 On the bed, she displays an exquisite crocheted coverlet. She hung a unique art piece by Rania Hassan over the bed. 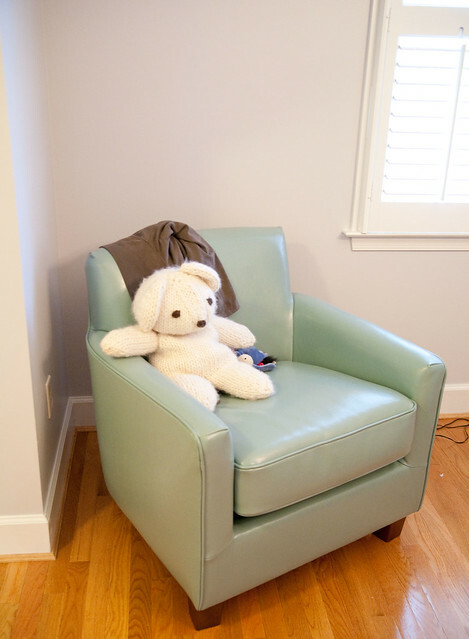 Danielle made the bear snuggled in the leather seat from World Market as a shop sample. 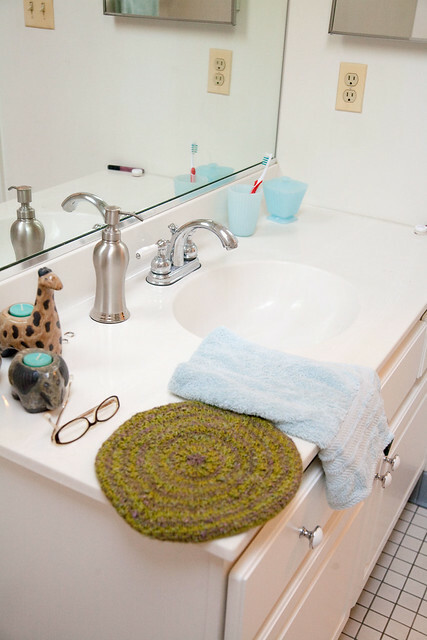 I also couldn’t help but notice the vintage knitting needles that she has on display on the dresser and a handknit beret that Danielle casually left on the counter in the master bathroom – more telltale signs of her preoccupation with all things knitted. Danielle and Phillip are still working on redesigning the rest of second floor, but they’ve already painted and replaced the light fixtures. 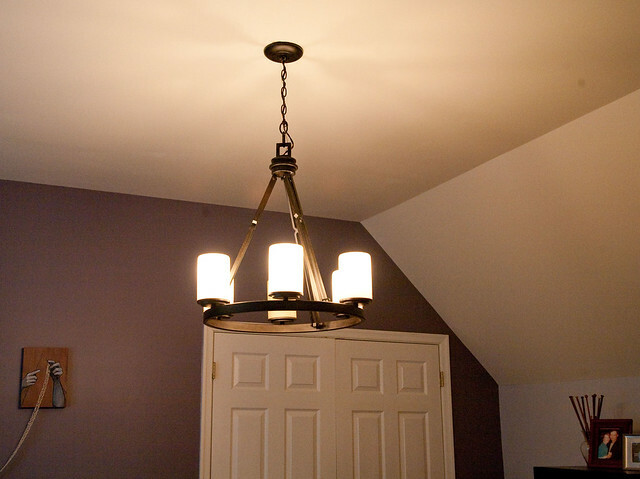 The light fixture in the bedroom comes from Home Depot. They have plans to redo the bathroom in a “banging new color” and add new lighting and vanity. She says the office is “still deciding what it wants to be.” I’d say it’s a great place to knit. 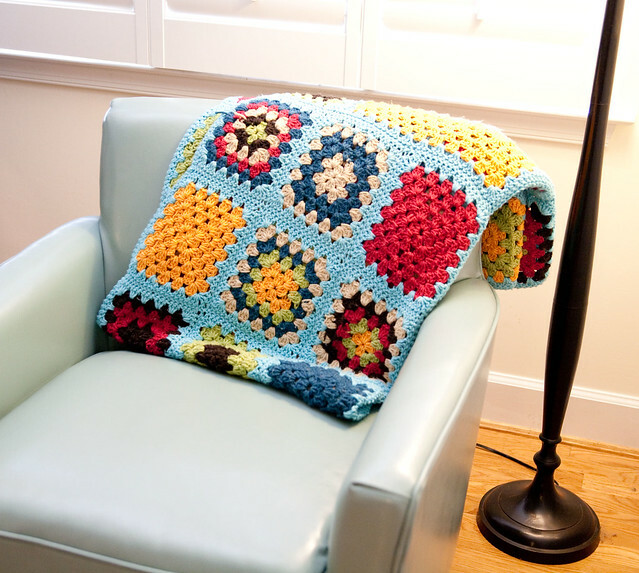 Draped over the chair as inspiration is a crocheted granny square blanket that Danielle’s mother made from the Spud and Chloe yarn Danielle carries in her store. And speaking of the yarn she carries at fibre space, Danielle has kindly agreed to write a guest post for DIY Del Ray this fall on knitting for the home. Can’t wait to see the projects she recommends and get a new one on my needles. Wow, they’ve done an amazing job, it’s beautiful! 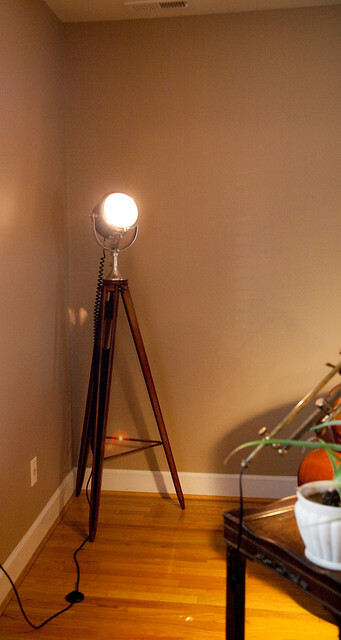 Love the light fixtures and that coffee table is simply perfect! What a gorgeous update to the kitchen! I’m ready to move in if they’ll let me! 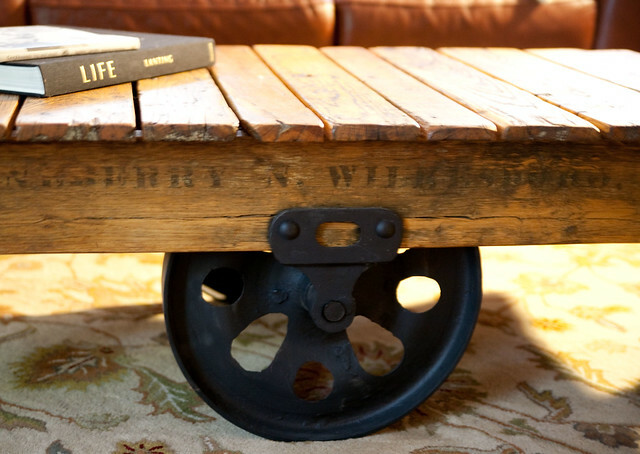 Love the industrial pieces they have chosen! 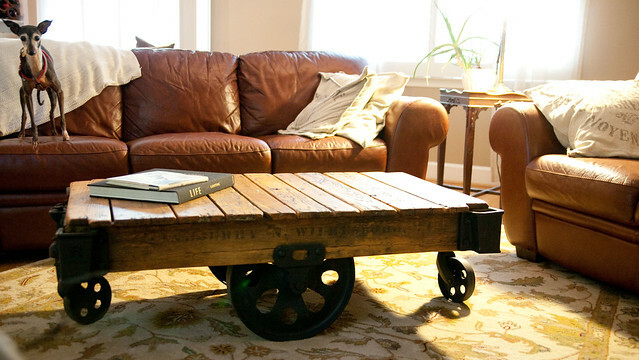 The red dining chairs, the barstools and the cart/coffee table are awesome. Would love to check out the salvage spot they found the next time I am in the area. 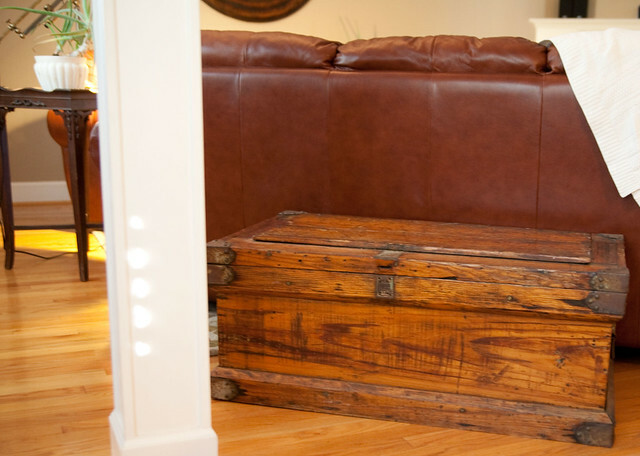 Danielle and Phillip have created a warm urban dwelling mixing just the right pieces of antique and vintage. Love it! Thanks for sharing. 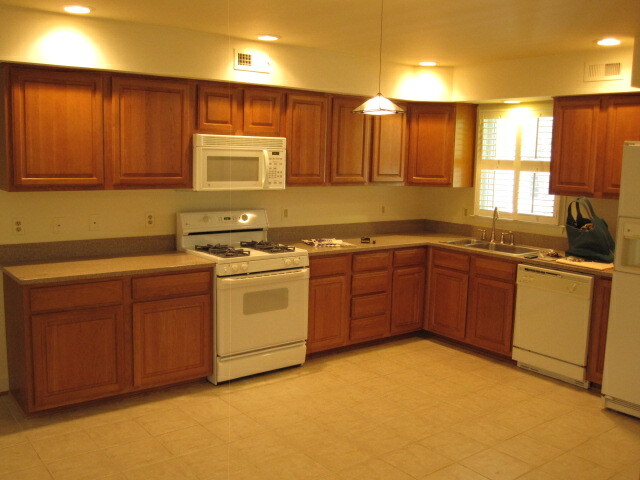 This is exactly what I would like to do with the kitchen in our new house. Thank you for the ideas. Love your new home! Looks great, love the article! Are you going to cover what she is doing with her new home? I am, Dawn. I’m going to show her kitchen reno soon.